In counseling last week, we talked about a new idea to me – our emotional bathtubs. Think of your regular bathtub at home, but instead of water, it’s filled with all our feelings – stress, exhaustion, etc. Unlike regular bathtubs, our emotional tubs can go from empty to IMMEDIATELY FULL within seconds – often when we’re overcome by emotions, stress, or a new situation. We’ve got all the feelings, but our tub can’t hold them in anymore, and suddenly they are spilling over into places and onto people they were never intended to. And while it can take mere seconds for our emotional bathtubs to fill up, draining them takes quite a bit of time, just like a regular bathtub. We’ve got to pull the plug and wait for the water to clear. Slowly. I had one of those FULL TUB moments a couple of weeks ago. We’d just started the school year and I’d been looking forward to new routines and time to get things done – things I’d let go during the summer. But as soon as the year began, we all got sick, one right after another. Fevers, rashes, the whole ridiculous thing, and it lasted for two full weeks. Two weeks I’d planned on using to get stuff done, but instead spent all my time administering oils, passing out ibuprofen, and washing everything. Twice. Towards the end of those weeks, I could feel the stress building up inside me. Now I was even MORE behind, and I couldn’t even remember all the things I knew I was supposed to be doing! Nothing was organized and I felt so scattered, I couldn’t even figure out where to start when I DID have a little time to work. I could feel myself on the verge of screaming at everyone and everything, so I excused myself with a notebook, a pen + paper, and my headphones. I put on some calming music and started making THE LIST. The scattered feeling of not being able to remember everything I want to remember always gives me a bit of panic. So, I started by writing down everything I could remember – my master list of THINGS TO DO. There was no order to the list – the point was just to get everything out of my head and onto paper. And , as always, when I started writing things down, I remembered more. After a few minutes, I’d gotten all of my stress written out in black and white. And I could feel my bathtub draining. This clearing of mental clutter – getting everything out of my head and onto paper, it’s incredibly life-giving. As women, there’s SO MUCH that we’re managing in our heads on a daily basis. When we give ourselves a physical place to write things down, instead of giving up our mental space trying to remember them, our stress level plummets, and our productivity actually increases. Here’s the thing – it’s not enough to just get everything out of our heads. We must then manage it. After everything has been dumped onto THE LIST, I started to prioritize – in two ways. I prayed over the list and asked the Lord if there was anything I really could let go of. Almost always, there are a few things I can cross out that don’t really need to get done. I went through the remaining list with three colored highlighters. Each color stands for a level of urgency. If something needs to be done immediately, it will be yellow. If it needs to be done soon, I’ll make it pink. If it’s not urgent, I’ll make it blue. Once everything was highlighted, I went through each color and NUMBERED those tasks in order of importance. Everything in yellow gets a number, starting with 1. Then, everything in pink gets a number, starting with 1. Same for blue. Lastly, I re-wrote my list IN ORDER. All the yellows went first, in number order. Then the pinks, then the blues. Finally, I had an actual, doable to-do list in my hands. And a much more clear mind and heart. Grab our free braindump + prioritized tasks worksheet. 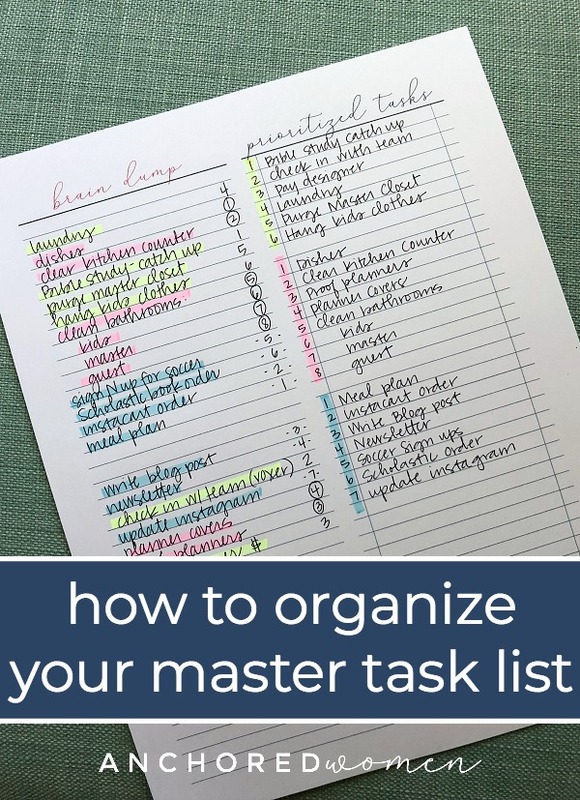 It's the perfect way to get everything out of your head and organized on paper! Listen, stopping after you’ve just braindumped your whole list might help you get everything out of your head, but it WON’T help you make progress on those things – so your stress is bound to come right back. And that’s not what we want. THAT is why I prioritize with colors and numbers. Organizing that list into three ordered sections is SO HELPFUL! It gives me a straightforward plan of attack, and I find myself a whole lot more clear on what I’m supposed to be doing, and when it needs to get done. I’ll be honest – I do this EVERY TIME I feel overwhelmed. 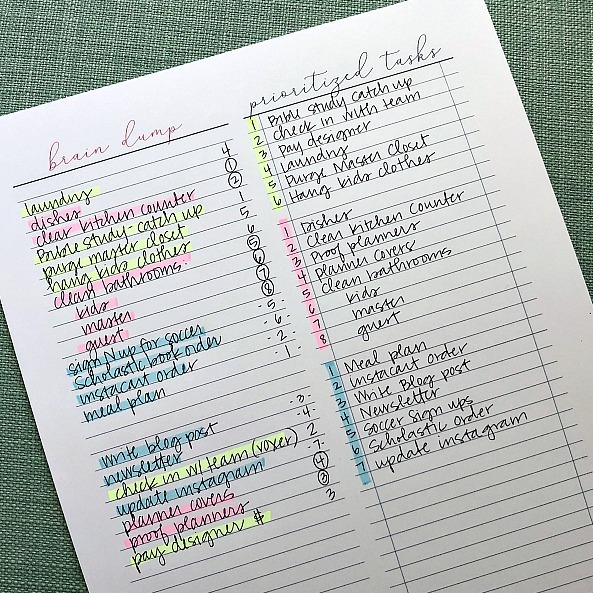 Braindumping, and then creating a prioritized list, is so beneficial for my mental well-being. Without it, I’m scrambling around to find something, anything to do, just so I can say I’m being productive. Instead of that fruitless process, clearing the clutter in my head gives me space to relax, take a deep breath, and then confidently move forward on something that actually matters to me (and my family). Braindumping is my very favorite strategy to use when I’m overwhelmed, when my bathtub is full of ALL THE FEELINGS. Generally, getting my thoughts, roles, and responsibilities organized helps me make a BIG step in the right direction – from scattered toward steadfast. How about you? Do you ever braindump? What’s your process? Tell me in the comments below! P.S. If you want my worksheet to move from braindump to prioritized list, you can get it by subscribing below! Yep! I brain dump and this is my go to for overwhelm, too! In fact, I had just this morning done a brain dump, before I read this post! 😊 It is so helpful. And, praying over whether the thing is urgent or not, and what God wants in my day – – so crucial. God will reorder my list, too, at times, and clarify my calling, reminding me of who and what are truly important and I’m responsible for, when I get pointed in the wrong direction. Thanks, Kayse! I love your brain dump printable, Kayse! It’s so easy – and uncomplicated! I just printed off 6 copies to do one and to be prepared for the next 5!!! This is great!!! Thanks Kayse! I’ve been trying harder to do a daily brain dump at the end of my day. Some days are better than others but I feel I’m making progress with my goals and To Do list. I love brain dumping! I try to do it every week, however, there have been a number of weeks where this brain dump has not gone any further than just a list of things. I love the way you then prioritise your list. I am definitely going to give it a go. I hope from there I can also turn these priorities into to-do tasks. That can be another challenge for me. Thanks again for a super blog post! This is so timely for me! I was really looking forward to having the kids in school and there was so much that didn’t work out the way I planned. (Busing issues, a sick kiddo, doctor appointments, after school band practice and football games) I just wanted that time to get things done, to make a plan for new routines, and to just have some time to myself to recharge. I did do a brain dump of sorts. I just sat down and wrote out everything that was going on in my head. I still need to go through and pray and prioritize everything. For the past week we have been dealing with Hurricane Florence and all the wind, rain, flooding, and power outages. The kids haven’t been in school since last Wed. We are not sure when they will go back at this point due to flooding. It has been so stressful. I am going to take some time today and follow your example. It’s time to drain the bathtub! This is a brilliant take on brain dumping! I’ve put it all out there on paper before but have never prayed about my list (oops). Color coding for sure helps make sure things are prioritized and helps the main things get done. I’m so doing this! I have never brain dumped before but will be using this strategy in the future. The first few weeks of school are always very busy for us and this year our son is a senior so we have added many senior parent activities to our to do list. I have been feeling very overwhelmed lately and had a meltdown a couple days ago. I will be doing a brain dump next time that overwhelming feeling hits me. What a great strategy. Thank you so much for sharing.